The History of Future Folk is a light and zippy alien comedy, which feels like Flight of the Conchords but with a touch of Blues Brothers and a touch of Safety Not Guaranteed. If that sounds like your cup of tea, you should definitely check it out. Luckily, Future Folk is available on Video On Demand starting tomorrow, so if you're not in the handful of cities where it's slowly hitting theaters, you can still be among the first to see it. It's not a perfect film — one major subplot is a smidge annoying, and the plot is a tad flimsy — but the music is fantastic and the comedy is almost all superb. In History of Future Folk, an alien named General Trius comes from the planet Hondo, which is threatened by a massive comet. Trius is seeking a new home for the Hondonians, so he's prepared to wipe out the human race — until he hears music for the first time. He falls in love with music, changes his name to Bill, and becomes a bluegrass/folk musician. He also gets married, has a kid, and keeps working on a way to stop that comet so the Hondonians won't need Earth. When a second Hondonian, Kevin, shows up to kill General Trius, he too discovers music. 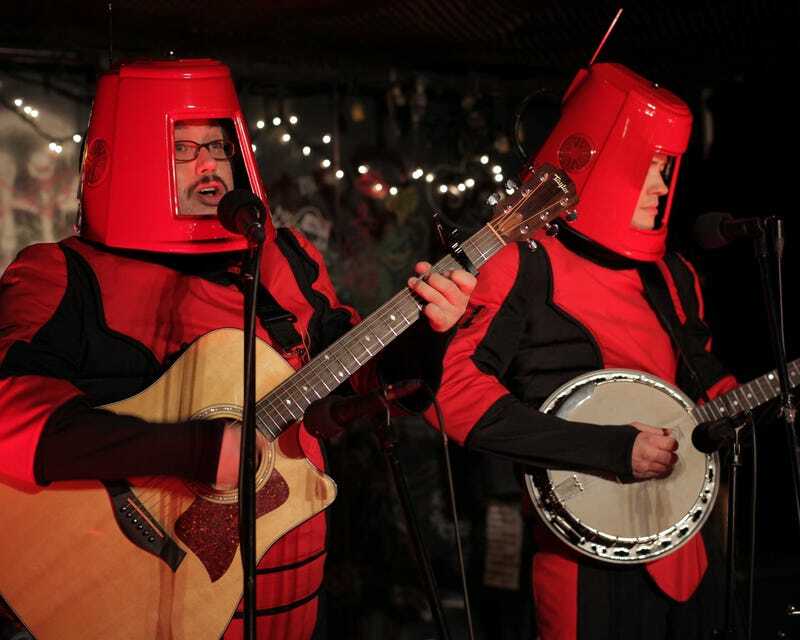 And the two would-be invaders wind up becoming a bluegrass duo, named Future Folk, singing some brilliant songs about farming space worms and missing their home planet. The original songs in this movie are seriously killer, and the "space worms" song is an earworm. And of course, the film is a romance — which is both good and bad. The good part is General Trius/Bill's relationship with his wife, who doesn't know he's an alien and starts freaking out after Kevin's antics get the police involved. General Trius has to find a way to explain the truth to his wife, and win her back. This is portrayed cunningly enough to serve as a metaphor for any and all marital problems, as well as touching on the notion of being a secret alien. The bad romance in the film is between Kevin and a police officer who tries to arrest him named Carmen (April L. Hernandez) — the whole thing never quite stops feeling a bit creepy, especially when Kevin uses his stun gun to basically roofie Carmen, so he can play his guitar for her and pitch woo at her. (At least that's all he does.) In the end, they do seem to get some real chemistry, and the scene where they tango together is great on its own, but it's still a bit ooky. But that's the only real problem with the film, and even that subplot winds up being kind of touching in the end. And luckily, the relationships between General Trius and his wife Holly, and between the General and Kevin, are at the center of the film — and those are just perfect. And the film nails the bouncy tone you'd want from a movie about failed alien invaders who become a beloved folk band. It's a fast, cheerful and most of all resolutely cute movie, that absolutely does not demand or expect brooding or deep thought. Most of all, this is one of those comedies that's both sweet and uplifting — it's a romcom in which the power of love is respected, whether that be love of family, of friends or of music. It's pretty much the perfect thing to watch on the couch on a hot summer night, while you're waiting for more angst and CG explosions at the multiplex. Definitely check this sucker out.